Sorry to have missed you, Rage, but hello to everyone who joins later. 1:52 Good night Rage, Wolf and all who follow. Hope your day is filled with warmth! Are you outside in your jammies?? And I always thought all robins were red. I was told that I needed to come here and give a fall color report. Our leaves changed right on schedule. We are at or just past peak in most of the places I travel. There isn't too much green left. Some leaves are still on the trees and some are waiting to be raked and jumped in. Don't break your boom-boom jumping into the leaves, Serena! 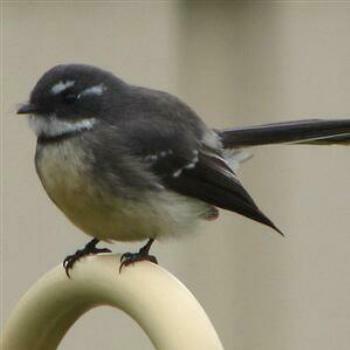 This little bird looks more like a chickadee to me. I agree, Jacalmi. It does look a lot like the Australian White-Breasted Robin, but it is definitely a Chickadee. Good catch! Morning all,nice of that Robin to pose for you ,Wendy, they don't stay still for long. No sun here, Shiela! There must be a good use for a day ensconced in dreariness & cold, wet drizzle... I'm still looking for it though! Thanks, Serena for your Leaf-Peepers Report from Vermont; nice to know there are some locations having a 'normal' Autumn! Enjoy what remains of your day & evening; make someone smile while you do! Just checking in, all is good here. Hi Rage, It is good to see that you are enjoying the poozles. I don't know why you weren't able to send me a PM, it usually works well. I'll post another poozle on Saturday. I hope you will have time to do it. Your message did arrive Rage, but only the heading was in it. Keep trying. We have a few trees that are starting to change colors. Slow to change this year, summer lasted longer than normal. What did the skeleton say before dinner? BONE appetit. His whole family found that HUMERUS.